In life and markets, timing is everything. Alibaba (BABA), the leading Chinese digital technology company, just reported explosive sales growth. Its first-quarter results prove that this company has a stranglehold on the most dynamic internet market in the world. 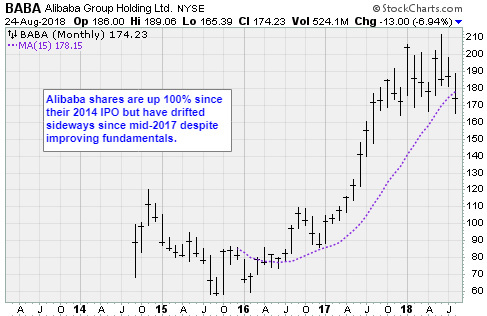 However, traders snubbed the stock and its 61% year-over-year revenue surge. Blame geopolitics. Investors should seize this opportunity. It is easy to get distracted. Jack Ma, the chief executive officer, has a penchant for 1980s choreography and Michael Jackson costumes. Just 9% of U.S. retail sales happen online. That number is 15.5% in China, and Alibaba accounts for about 70% of Chinese ecommerce. Then there is China. Westerners see the country through the lens of Tiananmen Square, repressive and backward. And an escalating trade war with the Trump administration is not helping change minds. However, Ma is building a company to rival Amazon.com (AMZN). Its home market is three times bigger and growing even faster. Its dominant businesses are more diverse, and the prospects are brighter. More important, Alibaba has unfettered access to massive amounts of data. As our regular readers know, data is the most valuable commodity in the age of information technology. With a population of 1.4 billion, China is 18% of the world’s population. Statista, an analytics firm owned by Dell Technologies, estimates 663 million Chinese have smartphones — twice the entire U.S. population. In 2016, McKinsey & Co., a global research firm, found the sheer size of the market led to profound advances in the way people complete transactions. Contactless payments have become ingrained in the culture. Paying for goods and services in the physical world is as simple as scanning a QR code, or tapping a smartphone app. It is safe and ubiquitous. And ecommerce has taken off, too. Online sales, at $499 billion in 2017, represent 15.5% of total Chinese sales. For comparison, only 9% of retail sales in the U.S. occur online. Through its subsidiaries, Alibaba accounts for 70% of Chinese ecommerce. And it collects a fee of 0.6% on every transaction. Alibaba packs and ships to third-party distribution centers worldwide … including Amazon warehouses. 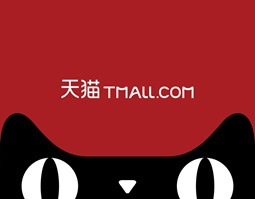 Its Tmall website has 61.4% of the lucrative business-to-consumer marketplace. 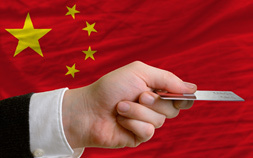 There, 70,000 Chinese and international brands sell products directly to 180 million shoppers. Its Taobao subsidiary operates the largest consumer-to-consumer website. Meanwhile, its original property, Alibaba.com, is still the largest business-to-business portal in the world. Alibaba sells everything from hair extensions to consumer electronics and expensive healthcare equipment. Products are packaged and shipped worldwide to third-party distribution centers … including Amazon warehouses. In the background, Alibaba is vertically integrating at a breakneck pace. The company already owns the Chinese equivalent of Amazon.com, YouTube, Yelp, OpenTable and PayPal. And it is only getting started with higher-margin business opportunities like cloud computing, internet services, media and messaging. Meanwhile, the Chinese government is proceeding with its plan to blanket the entire country with state-of-the-art facial recognition systems and other advanced biometrics. In January, The Washington Post reported that banks, airports, hotels and even public toilets are using the technology to identify “bad guys” who might otherwise slip by. In the West, this type of surveillance would drive privacy advocates into a frenzy. It simply could not happen. In China, it occurs without protest. This passivity is a huge competitive advantage for Alibaba. Data is the code for the artificial intelligence systems behind many new technology advances. Ultimately, these products are not restricted by borders. They will be licensed. Alibaba will get its cut. Right now, the company is caught in the crossfire of the trade war between the U.S. and China. Politics is hard. Predicting a ceasefire is folly. However, Alibaba had fiscal 2018 sales of $37.8 billion, up 61%, year-over-year. As a point of reference, the company had $8.6 billion in sales during fiscal 2014. These sales are largely restricted to China, they are growing exponentially, and they are unaffected by mean tweets and tariffs. 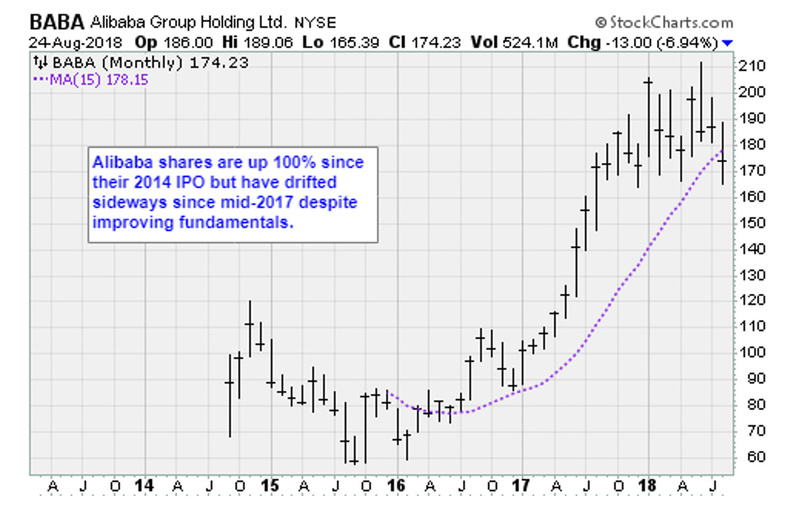 Investors are wrong to ignore Alibaba. Use the indifference to invest in the best ecommerce opportunity since Amazon.com. In WWII IG Farben was very profitable making Zyclon B for gassing people. Alibaba is similarly profitable processing data from facial surveillance cameras. You go right ahead and invest!